âLong-lasting anti-sun, high temperature resistance: anti-oxidation material, durable anti-sun, high temperature resistance, durable, widely used in parking sheds, containers, hoods, home garden defense, etc. âThe color of the image may deviate due to the difference in light and display. âThe product will be delivered within 7-21 days. If it is not received, please contact us in time! Construction site: protection of wood, aggregate and machinery. Farm: Protect food, animal feed and machinery. Family: Covers boats, trailers, swimming pools, garden furniture and barbecues. Leisure: floor, seat, picnic and beach mat, windproof. 1. Double-sided waterproof, waterproof, durable sun protection, sunshade. 2. Aluminum zinc buttonhole, high temperature stitching, not easy to leak. 3. Nylon rope surround, sturdy and durable, easy to use. 1. 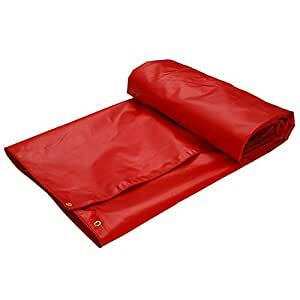 This product is hand-made, the tarpaulin needs to be sewn and covered, and the actual size is slightly normal for a few centimeters. 2. Due to the difference in personal display, slight chromatic aberration may occur. 3. All tarpaulins are perforated on all sides, and should not be pulled at will after piercing the eyes. Otherwise, the buttonholes may be deformed or peeled off. 4. Do not rub the waterproof oil onto the ground with strong force to avoid sharp sharp objects scratching the tarpaulin. 5. Large tarpaulins are not recommended for vertical suspension, and grommets cannot withstand the weight of tarpaulins. âMaterial: PVC coated cloth, 650g / m2, thickness: 0.65mm. âAdvantages: double-sided waterproof, high-temperature heat-sealed double-layer edging, nylon rope, rust-proof aluminum grommets, strong and wear-resistant. âMulti-purpose: Suitable for houses, gardens, outdoor, camping, etc. â Dimensions: 3 Ã 3 m, 4 Ã 3 m, 3 Ã 5 m, 6 Ã 4 m, 6 Ã 5 m, 7 Ã 5 m.
If you have time, you are welcome to browse and purchase in our store.